Having a supply of food on hand can sustain a family in the event of an emergency, and it's important to choose food items that can be stored safely and are easily accessible. Purchase a ready-made supply of food to keep on hand from a company specializing in non-perishable emergency food, or pull together your own inventory using the list provided. If you need help to access the printable list offered here, check out these helpful tips. Emergency preparedness expert Dr. Francis Edwards says there is more to gathering emergency food supplies than just buying a large quantity of canned goods. "Think about what you ordinarily eat and drink. I want to eat and drink what I eat and drink every day. Think about the psychological aspect - what do you reach for when you're stressed? You want comfort food." Robert Siciliano, personal and home security specialist with Best Home Security Companies and best-selling author, agrees with the need to include comfort foods in a food list for an emergency preparedness kit. According to Siciliano, "FEMA recommends the following items when selecting emergency food supplies." "Have a supply for a minimum of three days to three weeks," adds Siciliano. "Some prepare for an entire year." Dr. Edwards emphasizes the need for other life-sustaining supplies that should be kept with emergency food. "Discuss medication needs with your doctor. Always have a 30-day supply of medications. Your community will bring in food and water in an emergency, but nobody is going to bring your medications." Add non-prescription medication and vitamin supplements to your food supply for easy access in an emergency. Siciliano asserts the importance of an ample emergency water supply to accompany the food supply. "Buy pre-packaged bottled water and store it under beds." He also suggests having rain barrels for collecting rainwater. "Place the barrel at the base of your home's gutter." Keep a supply of food on hand for any pets within the home as well. Siciliano endorses three options for purchasing ready-made emergency preparedness food supplies. Wise Company: This company provides prepackaged, dehydrated meals that only need water to prepare. The long shelf life of these foods (up to 25 years) makes this a great option for long-term emergency preparedness. 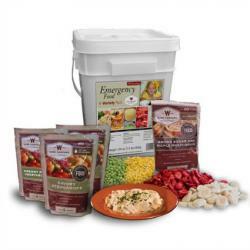 Valley Food Storage: Freeze dried foods and meals are available in a variety of quantities, and they offer gluten-free and dairy-free options as well. Free shipping is available on order of $150 or more. Costco: Membership warehouse Costco offers a rotating stock of emergency food kits and individual items alongside their other emergency-preparedness supplies. Instead of buying a ready-made kit, you can also choose to piece together your own kit using foods that are specifically designed to have a long shelf-life. 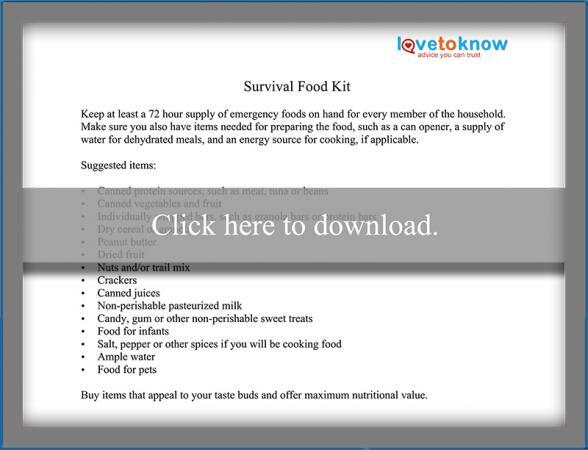 As editor for LoveToKnow Safety, I was sent samples from Mountain House, a company that makes dehydrated meals designed for emergency preparedness and for other scenarios such as camping trips. The food I reviewed was incredibly easy to prepare, had a long shelf life, was easy to store, and tasted good. Mountain House's food boasts a 12-year shelf life in pouches and a 25-year shelf life in cans, which makes it ideal for long-term food supplies. Store your emergency food in a place where it is accessible. A cool, dry area is best. "Buy a large trash bin on wheels and use that as a storage bin," advises Dr. Edwards. "It's easy to move." Siciliano adds, "Store food in a place above what might get flooded and away from pests or animals." Dr. Edwards says some food should be stored in the family car, and parents should consider creating an emergency food kit that each child can store at school. Rotate your food supply to make sure the items you have on hand haven't expired. Pay attention to expiration dates and check periodically to ensure all items are still intact in their packages. 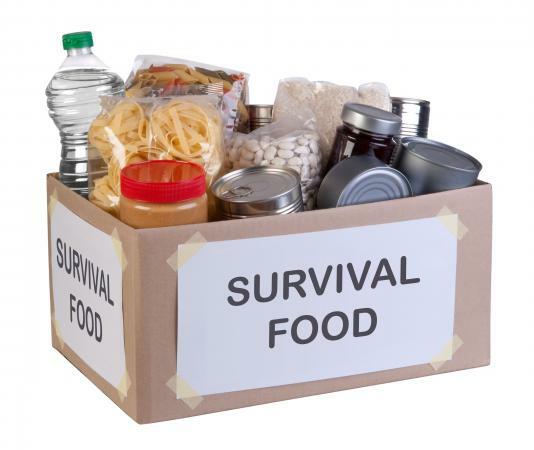 Having shelf-stable food available in an emergency can keep a bad situation from turning into a catastrophic one. Whether you piece together an inventory or purchase a ready-made, full food supply kit, knowing that there is food available in an emergency can bring comfort to everyone in your household.